Born in Holtsee near Kiel, Germany, Dorothea Loerzer arrived at Ellis Island on 7 Nov. 1908 aboard the Kaiserin Auguste Victoria to live with an uncle in Chicago. Five years later, on 8 Oct 1913, Arthur H. R. Berthold arrived in NewYork aboard the giant new German ship S.S. Imperator. His father Hugo was a dentist and early orthodontist in Sorau, Germany (now Żary, Poland); his son Arthur became a dentist and orthodontist in Chicago. 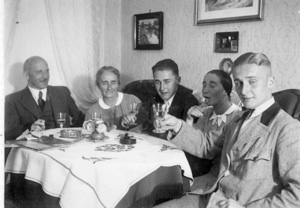 Arthur and Dorthea were married about two years later; they had two sons—(Dietrich) George Berthold and Arthur Frank Berthold.